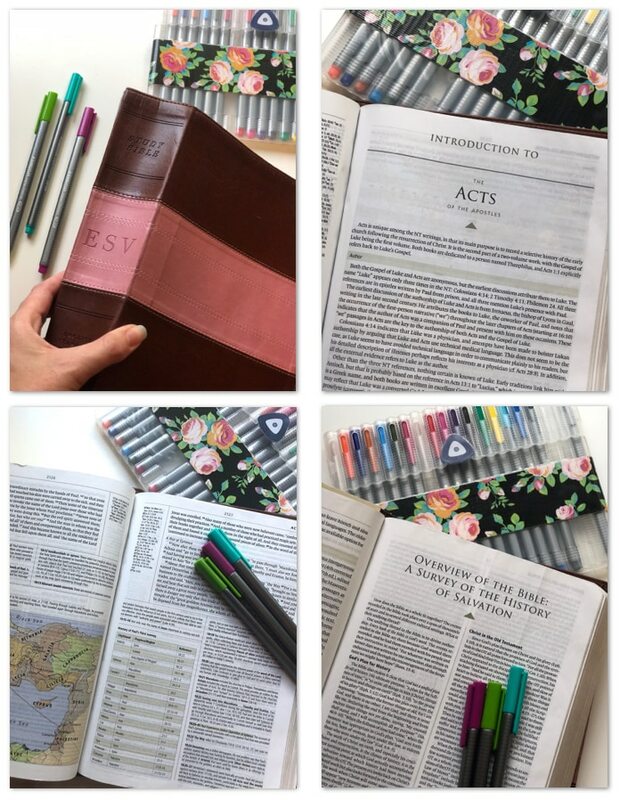 Today I’m sharing the answer to one of the frequently asked questions I receive: “What is your favorite Bible?” Though I have many Bibles on my shelf, the one I consistently recommend is the ESV Study Bible Full Disclosure: At no additional cost to you, I earn a commission if you click this link and make a purchase. Thanks for your support! . I’ve used the ESV Study Bible Full Disclosure: At no additional cost to you, I earn a commission if you click this link and make a purchase. Thanks for your support! in various ways throughout the years. 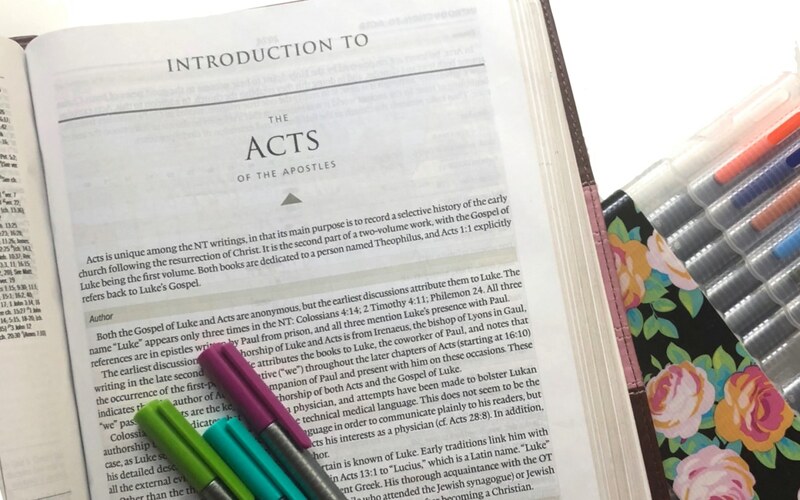 The ESV (stands for English Standard Version) is the translation I love to study from the most because it is more of a “word-for-word” translation than most others, which makes it a great Bible to study from. The ESV is also my preferred version for Scripture memory, mainly because it is most familiar to me. Nowadays this copy collects dust on my shelf because I have learned how to access all the ESV Study Bible Full Disclosure: At no additional cost to you, I earn a commission if you click this link and make a purchase. Thanks for your support! goodness on-the-go through the free ESV Bible app. It is AMAZING!! This is one of the biggest reasons why I love the ESV study Bible Full Disclosure: At no additional cost to you, I earn a commission if you click this link and make a purchase. Thanks for your support! so much. There are other study Bibles just as solid as this one, but (as far as I am aware of) this is the only one who boasts this incredible feature. 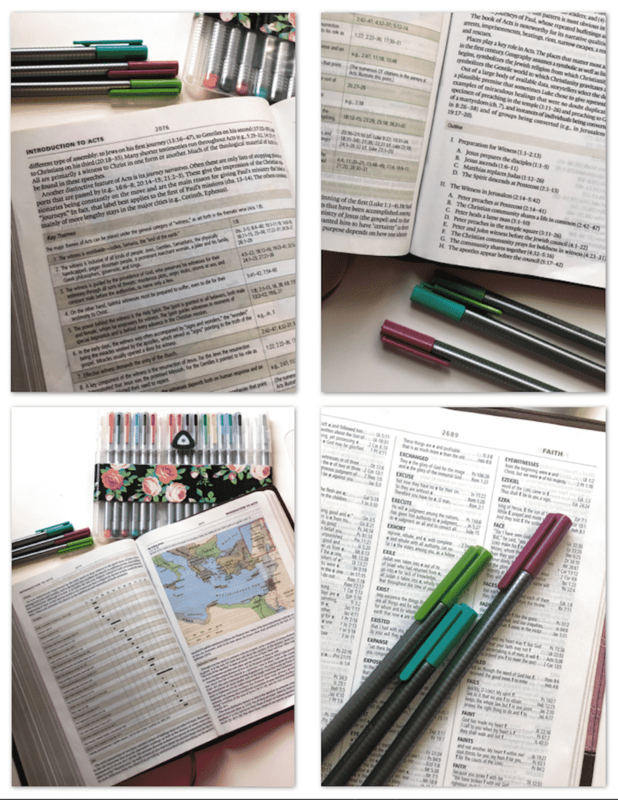 I can access the same study notes, charts, maps, and all the other resources included in the ESV Study Bible Full Disclosure: At no additional cost to you, I earn a commission if you click this link and make a purchase. Thanks for your support! at the tap of a button on my phone. I typically consult it multiple times a week, if not daily. It is super-convenient having all these Bible study charts, maps, notes, and book information with me at all times. 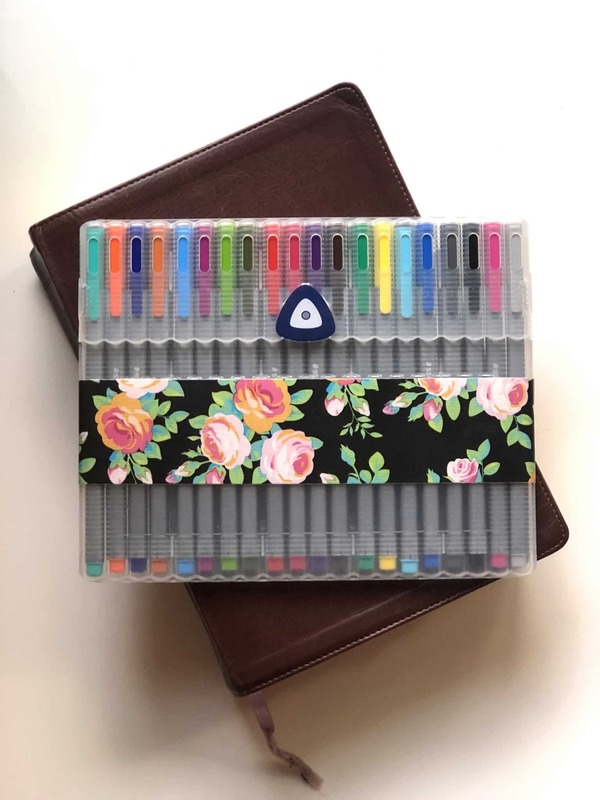 Alongside the “favorite Bible” question, I get a bunch of questions about the pens I use! 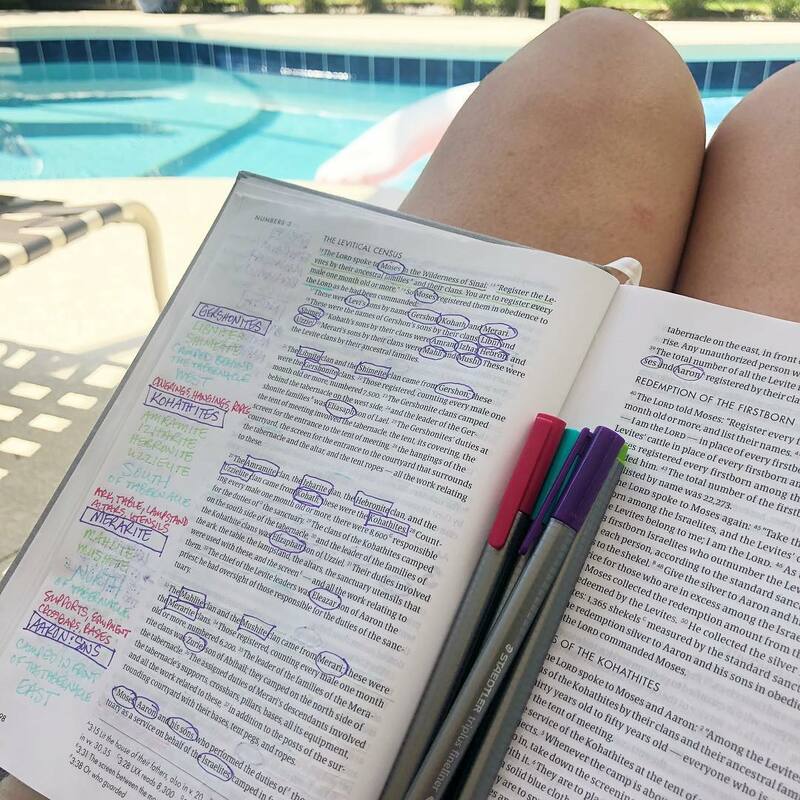 Though not necessary, I think it is great to personalize our Bible study time. 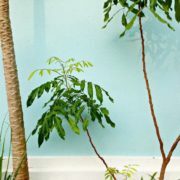 This is a time to enjoy, and I enjoy color (plus, I am a very visual learner!) so some nice colorful pens are a must for me. My all-time favorite pens are Staedtler Pens. 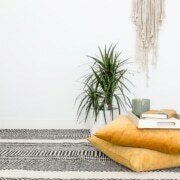 I have several sets of the Triplus Fineliner Full Disclosure: At no additional cost to you, I earn a commission if you click this link and make a purchase. Thanks for your support! in the plastic case (one for home, one for my church bag), and one in the pink roll case Full Disclosure: At no additional cost to you, I earn a commission if you click this link and make a purchase. Thanks for your support! which I purchased when it was marked down and keep in my handbag for the kids to use while we are out and about. As you can tell, I don’t like to be stuck without my pens! They don’t bleed (unless you write over and over again in one spot). 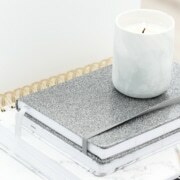 The case converts into an easel that props up the pens for easy access. They are fine point at 0.3mm, which is small enough to be able to take lots of notes in my Bible. The only problem I’ve had with these pens is actually with the case … it kept popping open while in the easel position. I grabbed some gorgeous floral duck tape Full Disclosure: At no additional cost to you, I earn a commission if you click this link and make a purchase. Thanks for your support! to keep it shut. Problem solved and my case was further beautified! How do I forgive when I don't feel like it? For something to be out of bounds, there must be a boundary. Can you share more information about the ESV Bible app. There are so many Bible apps and I wasn’t sure which one it was. I’d love to try it out! I’ll add it into the post, too!! I have this ESV Study Bible and I absolutely love it! It is chock full of historical information, which I’ve grown to love more and more. Love love love it. The only thing I find difficult is there is not a lot of spare room for writing – but that’s because so much is packed into this Bible. BUT – I’m ok with that, because of the awesome study information. I ordered the pens and love them!! 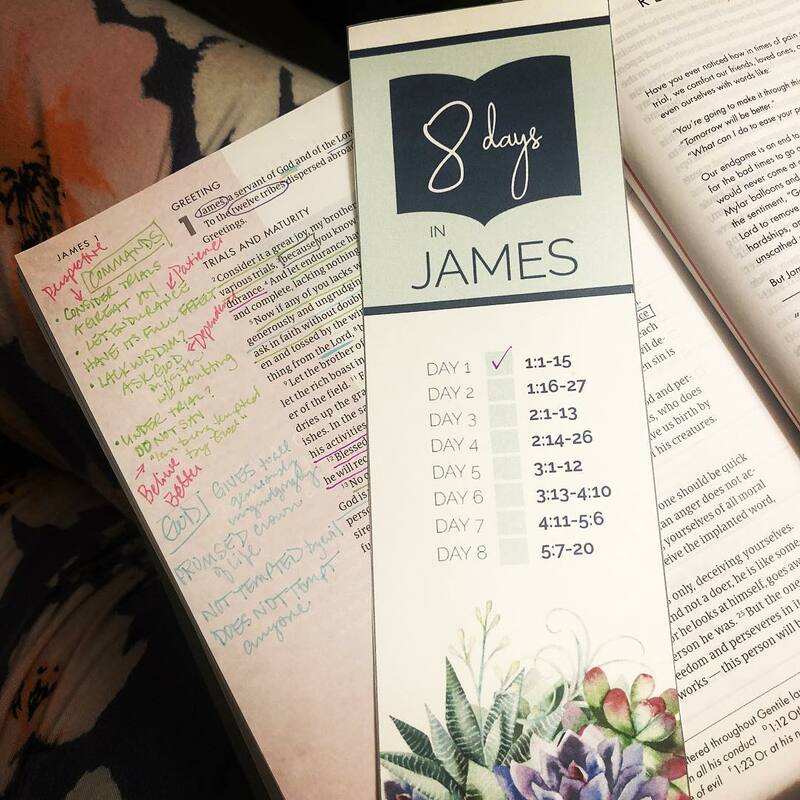 I am already an ESV girl and every since I met you at the ladies conference in Pineville, LA I am obsessed with the BLB app. 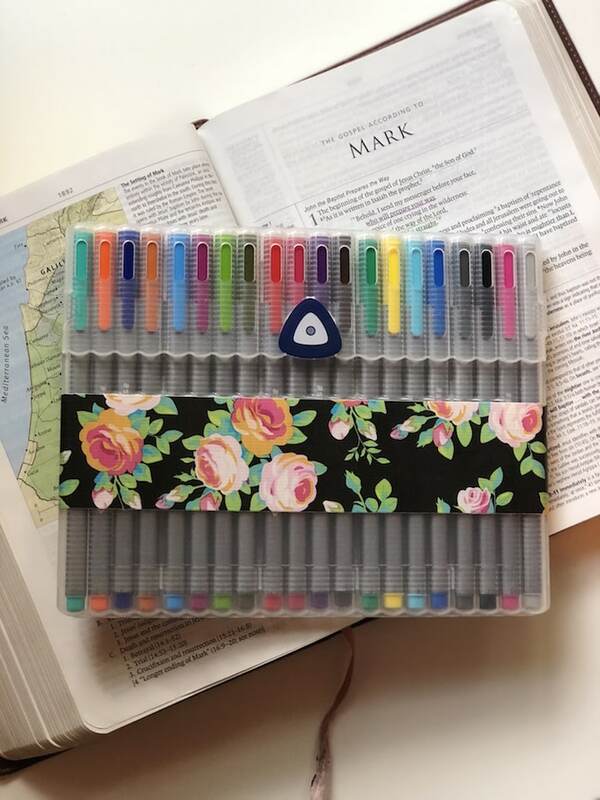 That’s a pretty bible you got there lady and the pens aren’t bad either.